Who do you blame when you come home and the kitchen trash is strewn all over the house and your dog looks quite satisfied? If you said you or some other human in your home you are correct! If you leave a trash can where your dogs can get to it, they are going to go through it. To a dog, the kitchen trash is a cornucopia of wonderful smells and food scraps and he is going to revel in this sensory bacchanalia with gusto. So, I just sigh and start cleaning up the mess reminding myself to shut the pantry door so Dudley can’t get to the trash. Fortunately, there was nothing in the trash that could hurt him. The week before Dudley blew out his knee, I left a package of sirloin steaks on the counter and sure enough Dudley managed to get the pack and get outside with it. He dropped the package and took off with one of the steaks. He did leave me one for supper. I took the following picture shortly after he got the steak, I guess he was looking for dessert. Looking for a sirloin to purloin. 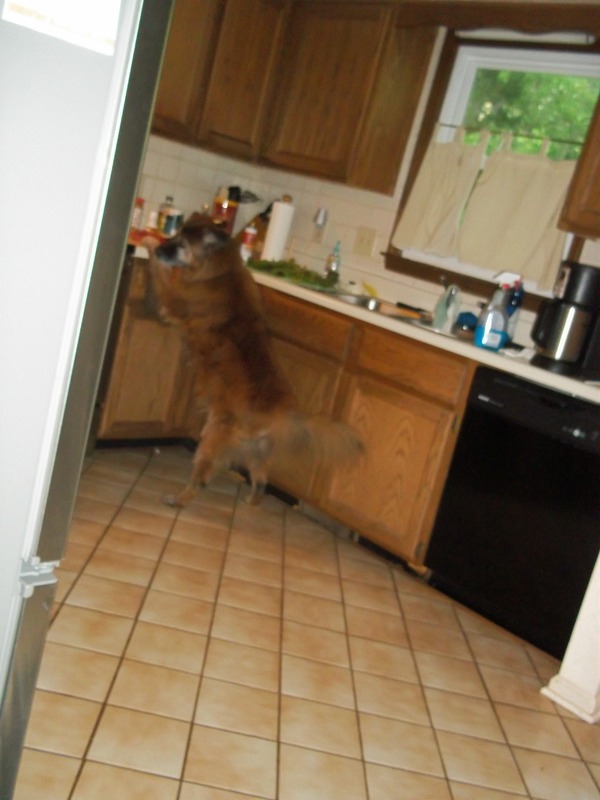 Dudley has always been a counter surfer and until I learned to set food back far enough that he can’t reach Dudley scored loaves of bread, jars of peanut butter, bacon, and one time, Belgian Waffles. He got the steaks because I had left them in a plastic bag. I had the bag set against the back of the counter, but the tail of the bag was long enough where Dudley could reach it and pull it to where he could abscond with it. The morning I made Belgian waffles, I had a few left over and wrapped them in wax paper and left them on the counter and then went to the store. When I got home I saw wax paper on the floor but it took a few seconds to connect it to the waffles. Dudley was lying under the table and when I asked him if he had eaten the waffles, he responded with a satisfied burp. Sometimes I think dogs totally understand sarcasm. Once Dudley took the round cardboard that comes with frozen pizzas. I kept hearing a thud, thud sound from the kitchen and got there in time to see Dudley make it through the dog door into the backyard. I went to look and there he was with the round cardboard looking for bits of cheese. The thud sounds I heard was the cardboard hitting the dog door because it was wider than the door. I’m not sure if he got through diagonally or the cardboard folded, but my boy did get out the door with it. Unless you catch a dog in the act of a “crime”, there is no point in disciplining him. He will never connect your yelling about the trash with the great fun he had going through it. I have caught Dudley nosing in the trash, taken the trash can out of his reach and told him “no”, but every time I cook and have the trash can out where I can easily get to it he still goes over and checks it out. Cesar Millan would have his hands full trying to retrain me. This entry was posted in Uncategorized and tagged canine, Cesar Millan, discipline, dogs, food. Bookmark the permalink.